What better way to kick off our new category with the announcement of the 2012 Man Asian Literary Prize winner ! The prestigious award was announced in Hong Kong on the 14th of March 2013. The Man Asian Literary Prize is an annual literary award given to the best novel by an Asian writer, either written in English or translated into English, and published in the previous calendar year. The judges choose a longlist of 10 to 15 titles announced in December each year, followed by a shortlist of 5 to 6 titles announced in January, and a winner is awarded in March. The winning author is awarded USD 30,000 and the translator (if any) USD 5,000. Submissions are invited through publishers based in any country. 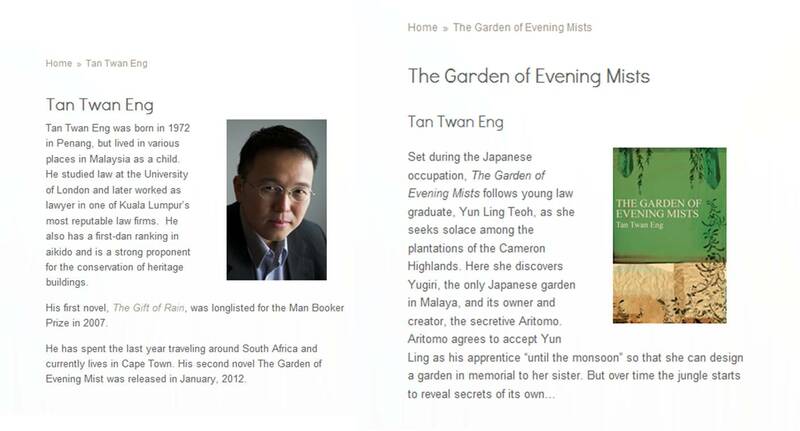 The Malaysian novelist’s The Garden of Evening Mists deals with the Japanese occupation in Malaysia, telling the story of war and relationships. About the author and the winning book: http://www.themanbookerprize.com. Posted on March 18, 2013 by ChalkandRaddyPosted in Visual ArtTagged Asia novelist, Asian Literature, Man Asian literary Prize 2012, Tan Twan Eng, The Garden of Evening Mists.